Happy the church which finds itself in a tourist hotspot - and happy the church explorers, too, for it means you are going to find it open. 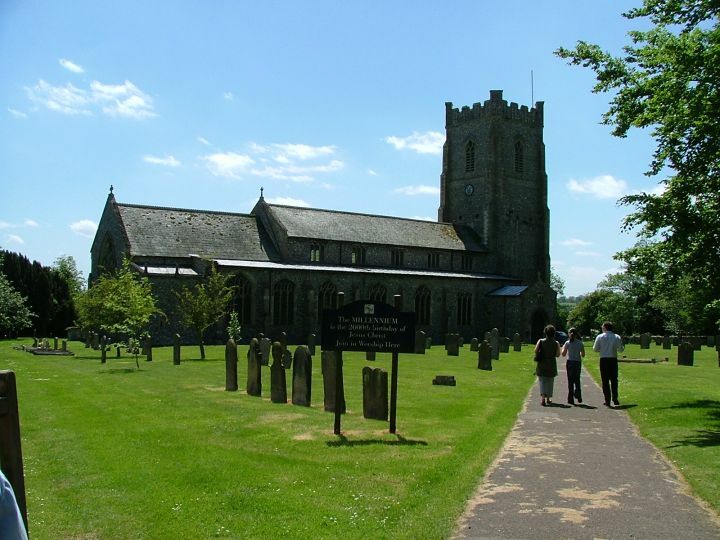 Actually, this part of Norfolk is remarkable for its number of open churches, and so it is with a happy heart that we can embark on the long path up to the porch of St James. 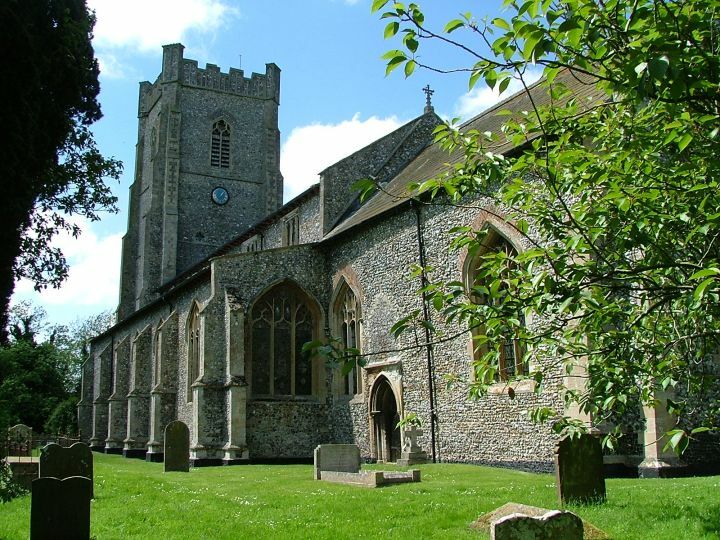 The church is exceptionally large, and a reminder to us what a busy place this was before the 16th century. 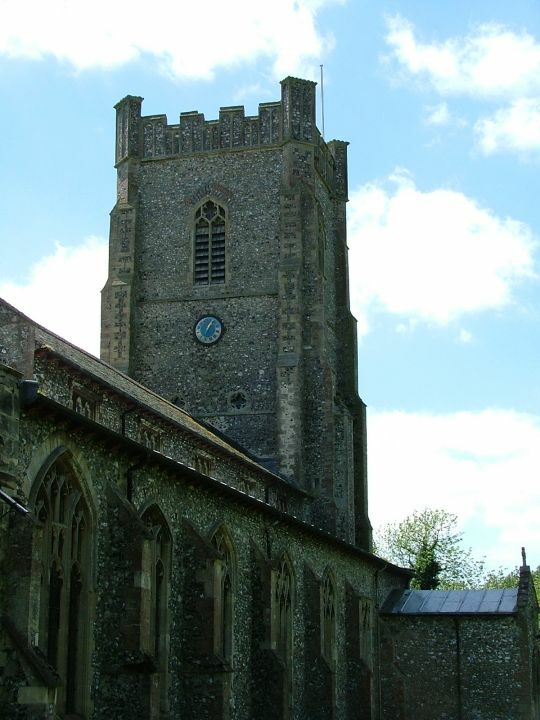 The magnificent 15th century Perpendicular tower is wholly rational, leaving the mysteries of the middle ages behind. A low clerestory and tall aisles accentuate the width of the place. 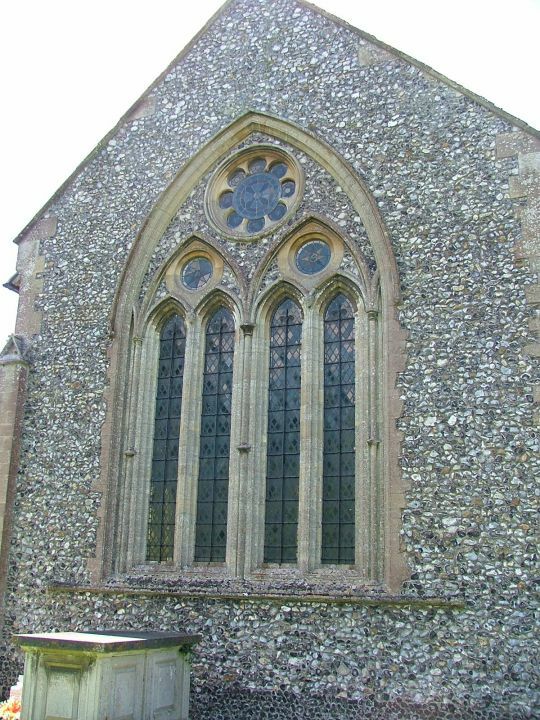 The east window plainly does not live up to the rest of it, being the result of Ewan Christian's middle-brow 1870s restoration. 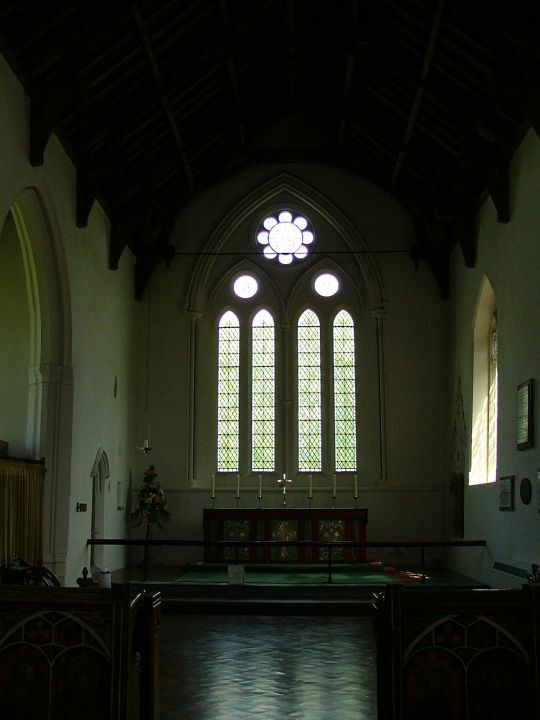 Lots of other windows appear to have been replaced, possibly earlier that century, but the chancel itself still retains broadly its early 14th century integrity. There are rather splendid bears sitting on the two-storey sacristy. 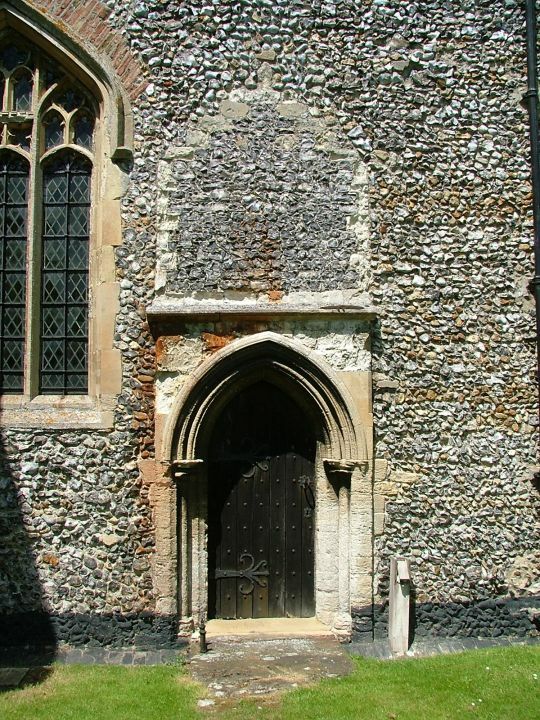 A curiosity on the south side of the church (that is, away from the village street) is that there is a large, blocked opening above the priest door. The doorway itself has been renewed, the opening blocked at that time. 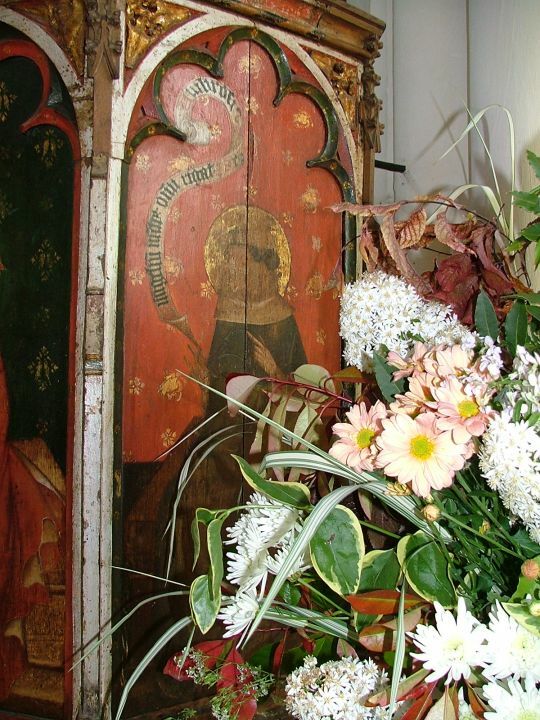 It was probably a window, but may have been the fixings of a priest door porch as at Trunch. 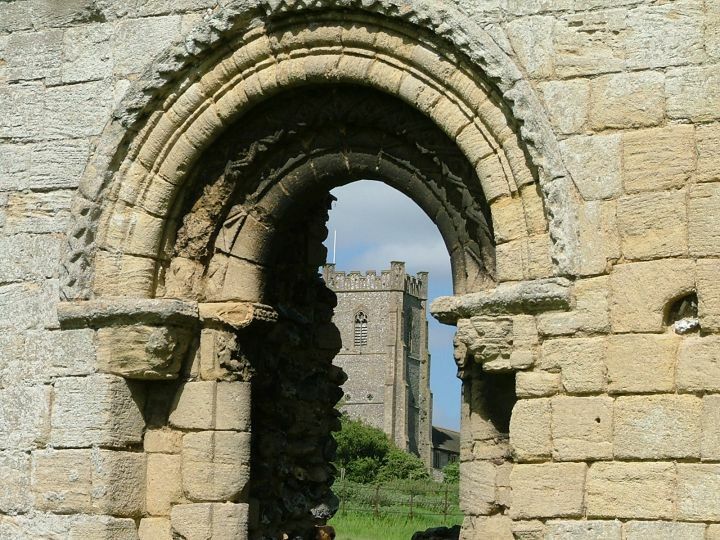 The suggestion that it was a 14 feet high doorway so that a knight could enter on horseback is not terribly likely - before the 16th century, people other than the Priest simply did not enter the chancel, let alone horses. 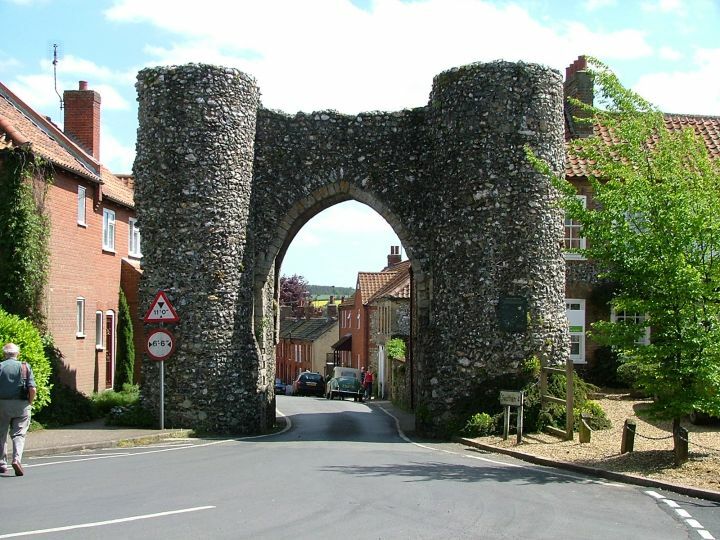 You will probably not find yourself on your own in St James, because it is one of the three main attractions of this pretty little hilltop village; and, conveniently, it sits halfway between the castle and the priory, just off of the little market place. But it is a big enough interior to bear company. 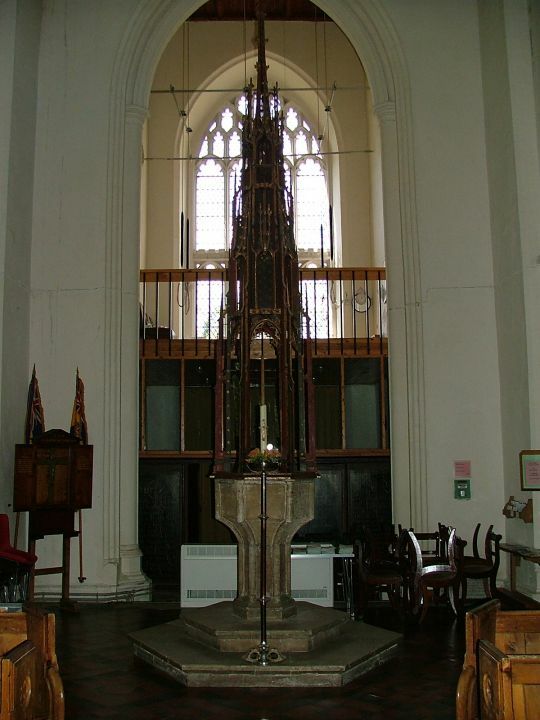 It is also very high in a different sense; this church is still in the Anglo-catholic tradition, with a working holy water stoup and the smell of incense. You can also light a candle, and there are of course those useful little notices for protestants explaining what it is all about. It is not just these features that remind me of the church at Little Walsingham. 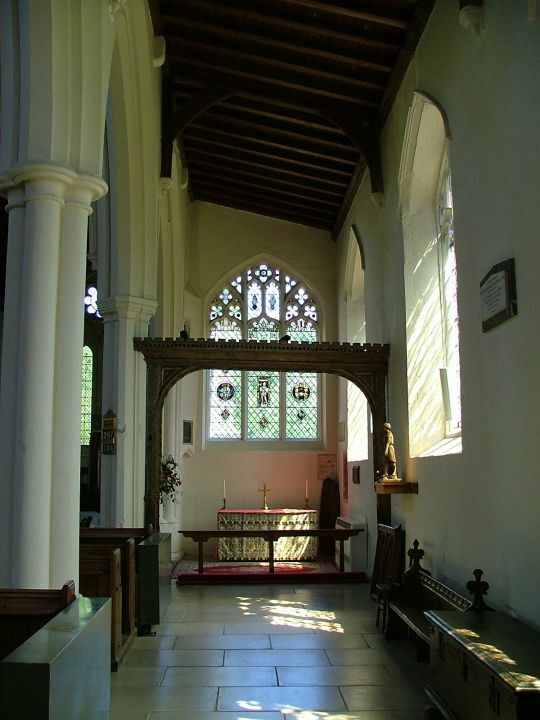 St James also has a bright, clean, fairly modern interior, with a number of medieval Catholic survivals dotted about. 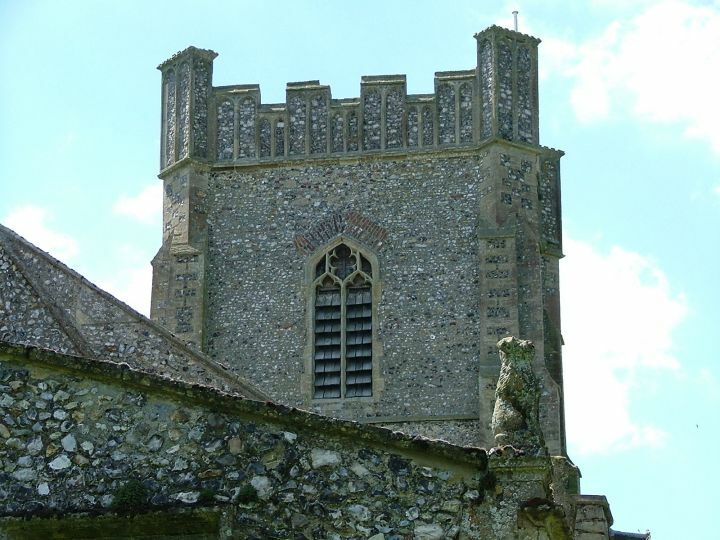 The first of these is Castle Acre's towering font cover, one of the best in Norfolk. It dates from the end of the 15th century, and the plain yet elegant font suits it well. The otherwise excellent guidebook repeats the myth that these covers were intended to stop people stealing holy water for witchcraft. A moment's thought will recognise that holy water was freely available in any case, because there were holy water stoups outside all entrances. People customarily took water holy water home to use in their own devotions, and this was an accepted practice, as it still is in Catholic culture to this day. The English hysteria about witchcraft did not really get going for another 100 years in any case, when those in charge were Anglicans. 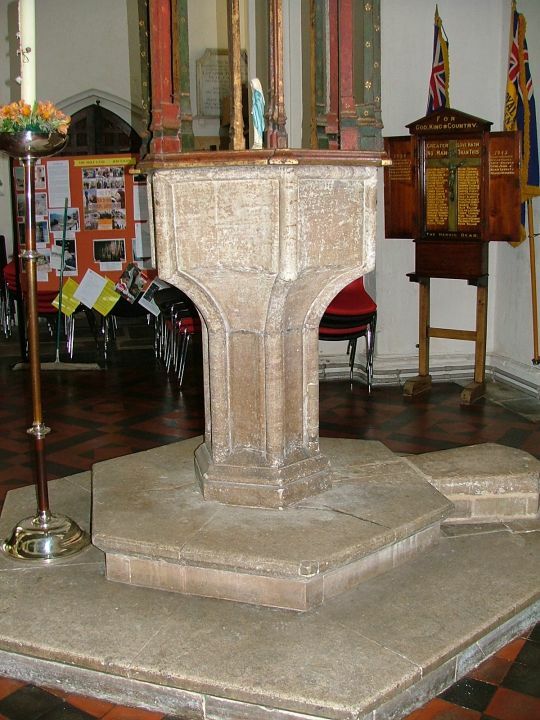 In fact, font covers were almost completely decorative, although it was important to have some means of preventing the water becoming contaminated with dirt, which explains the locking. 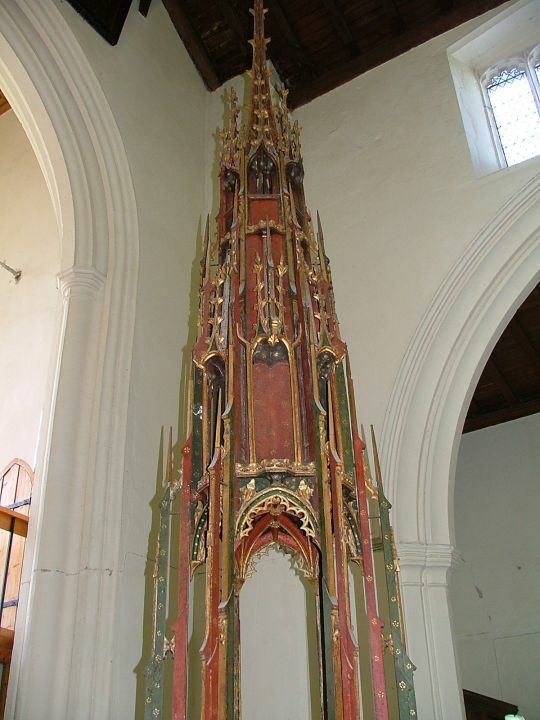 Castle Acre's greatest treasure is its splendid pulpit. This hexagonal wine-glass has five large panels, four of which feature Saints Augustine, Gregory, Jerome and Ambrose, the four Latin doctors of the Church. 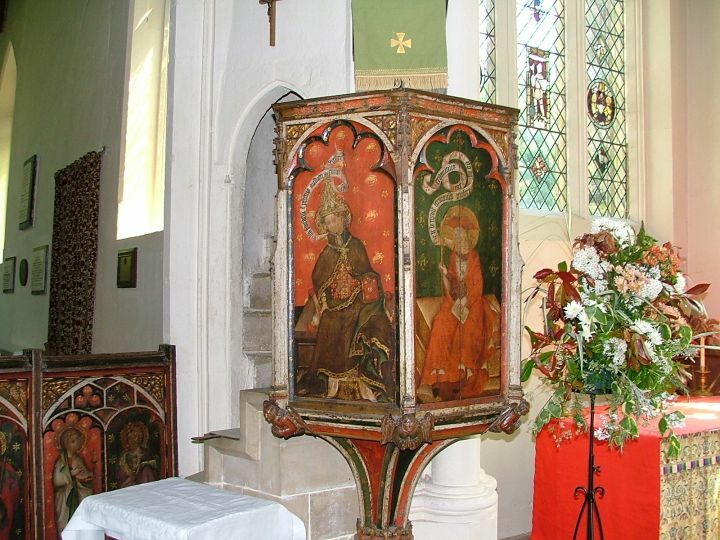 These four were a popular devotion in late medieval Norfolk, being found on numerous screens, at least one font, and on a similar pulpit at Burnham Norton. 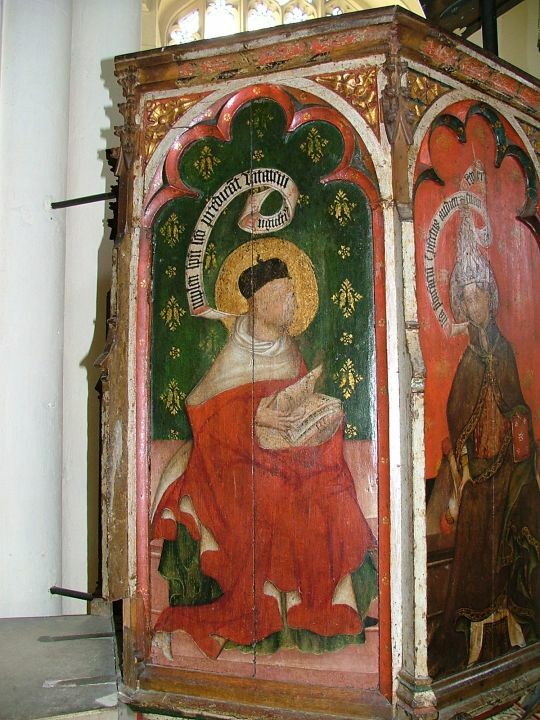 The pulpit there has two extra panels featuring the donors; perhaps the blank panel here did the same. The four doctors have been substantially restored, although it would appear that Gregory's papal tiara and Jerome's cardinal's hat have escaped their customary vandalism. 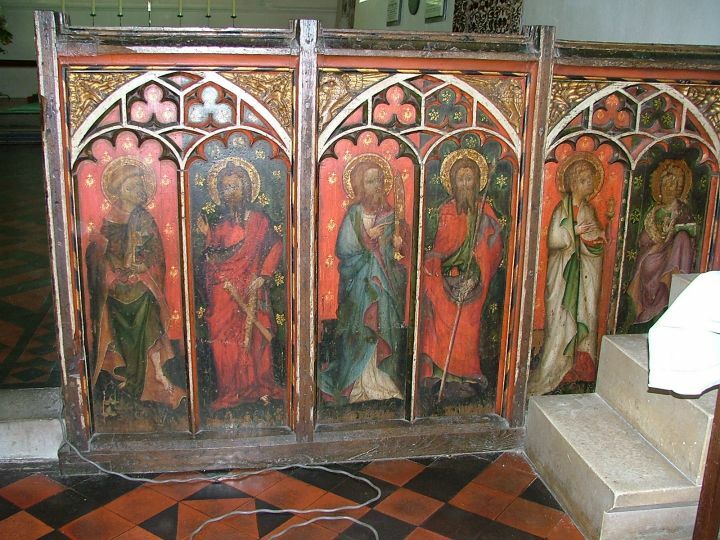 The dado of the roodscreen is all that survives, with very attractive cusping - indeed, the reliefs are super, and it is a shame that not more survives, and that the panels have been so over-restored. 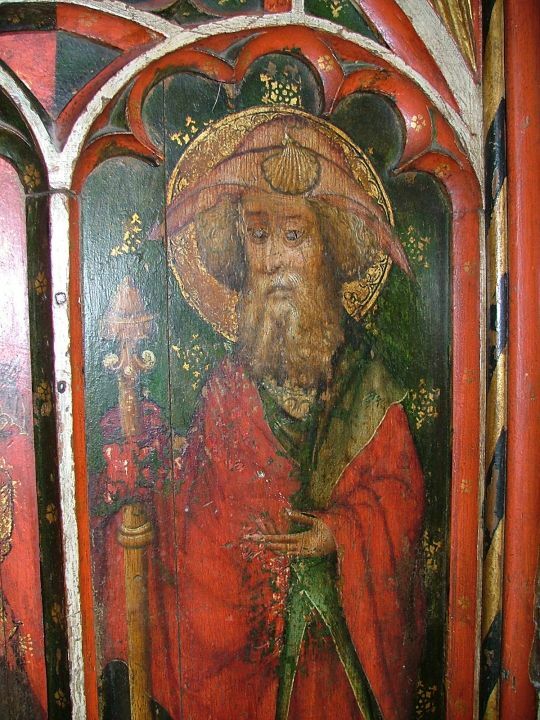 They feature the 11 original disciples and St Matthias. Although much of the painting you see now is Victorian, they appear to reproduce very faithfully what was there before. 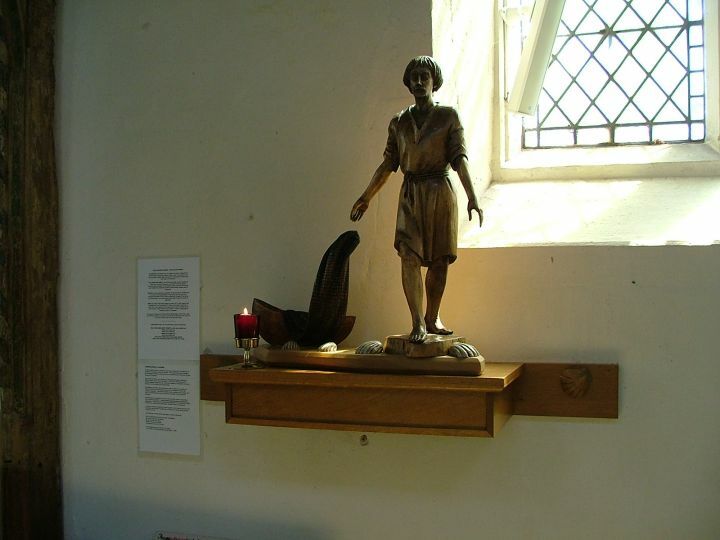 Two points of interest are the figures of St James and St Andrew. 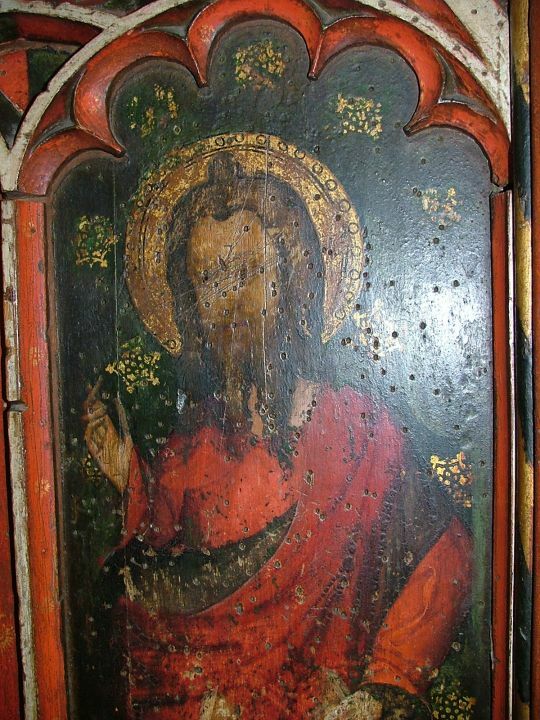 James has had his eyes gouged out, a reminder of how unpopular his cult was with the Anglican reformers. This was because of his association with pilgrimage, which in turn was connected with the doctrines of purgatory and prayers for the souls of the dead, both anathema to protestants. Andrew has been peppered with gun shot - this time probably not as a theological statement, but a misfiring of a bird gun. 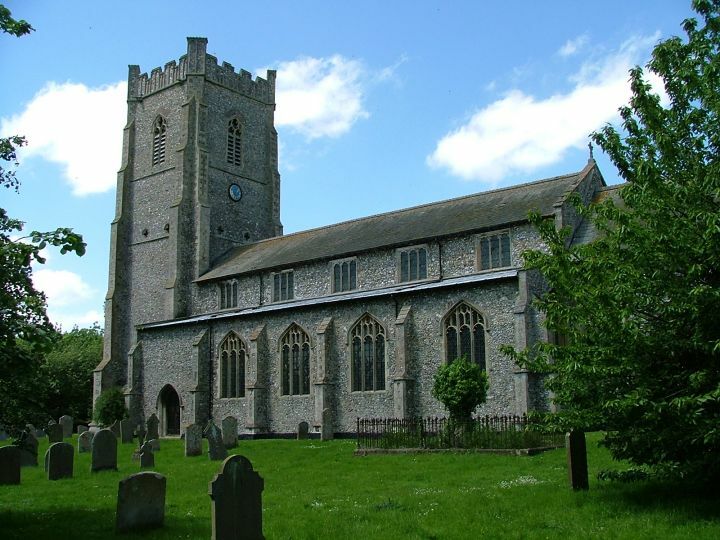 In the late 17th and 18th centuries, when the churches of England had generally fallen into a poor state of repair, there were often problems with birds, especially jackdaws, setting up home in the nave and chancel roofs. 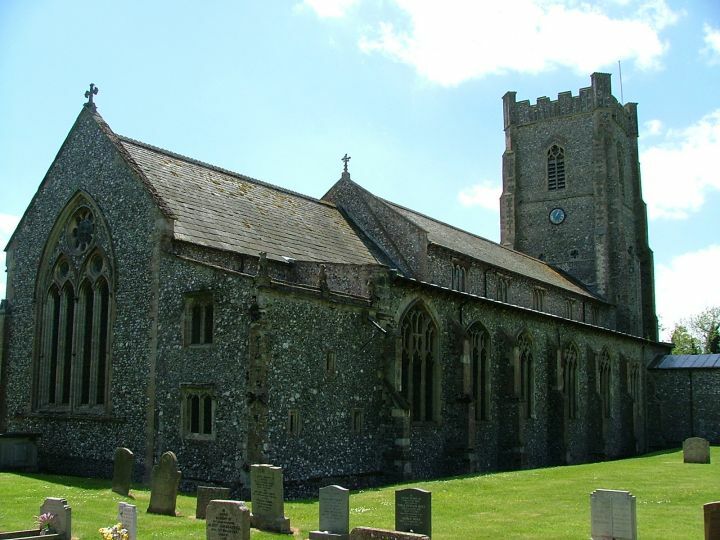 At Blythburgh in Suffolk and South Creake in Norfolk we find, documented in the churchwardens accounts, people being paid to shoot birds in church; at South Creake, where shotgun pellets have been found in the angel roof, it is recorded that no less than 120 were shot in 1680 alone. Perhaps Andrew had the misfortune to have a bird land on his panel, attracting the wrath of some local gun-toting youngster. Let us hope that no one was standing nearby; I assume that he had been told to only fire upwards. 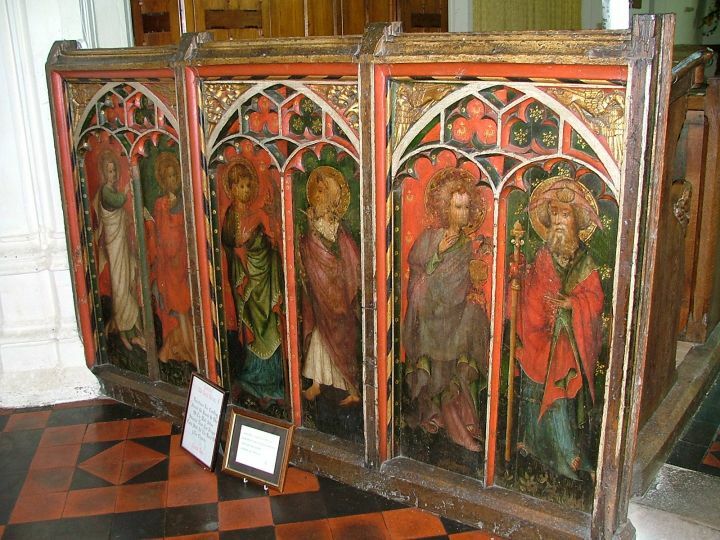 The rood screen was just part of an apparatus that ran the full width of the church, enclosing chapels at the east ends of both aisles. These have survived - or, at least, their wooden framing has, and you can see where the parclose lofts were. Once, you could have walked on them right across the church. 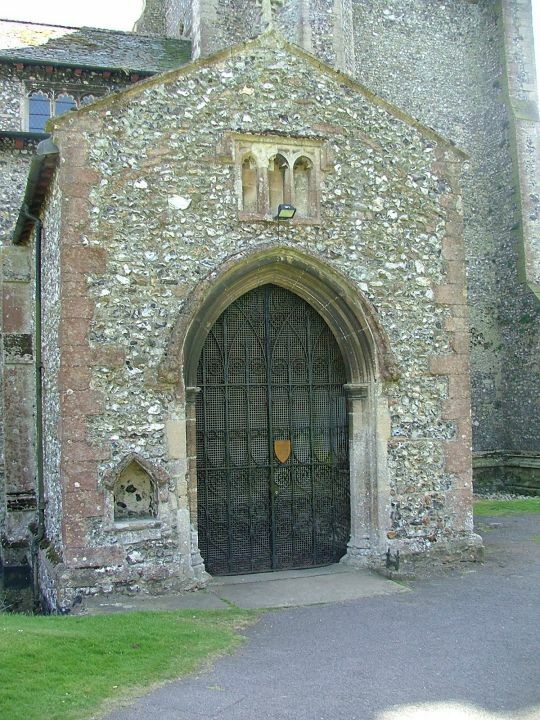 That in the south aisle encloses the St Nicholas chapel, which was its medieval designation. 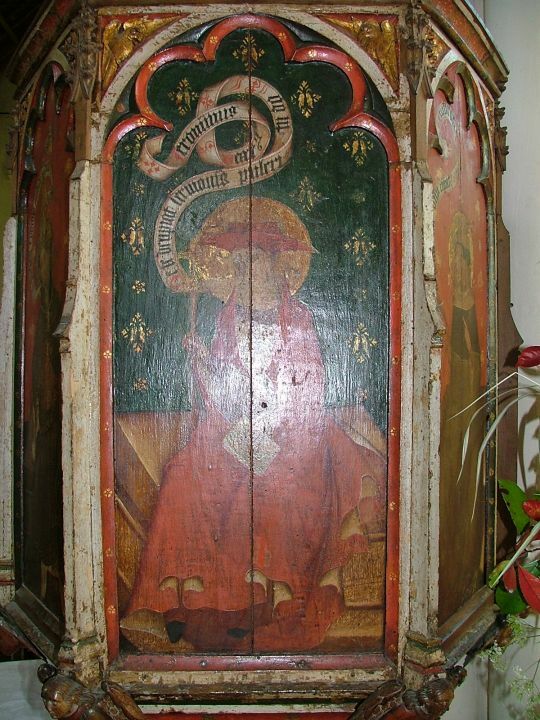 A surviving couple of screen panels feature his monogram. 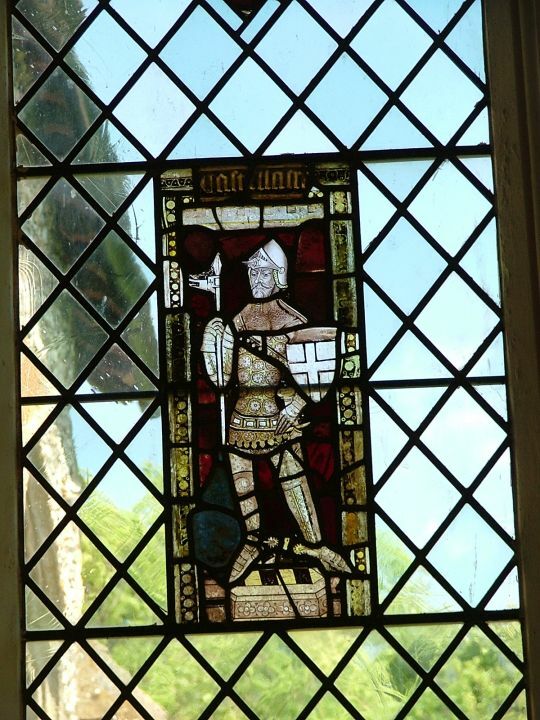 There is a good panel of medival glass here depicting a knight. 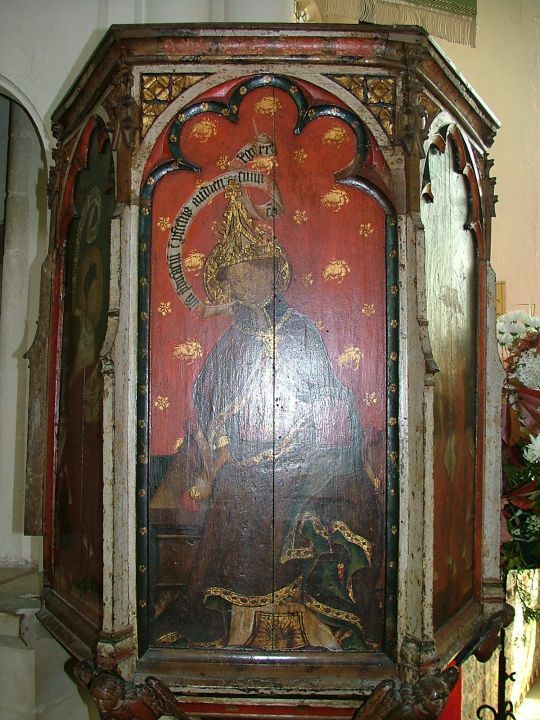 It probably does not represent St Gerorge, being partly composite; the shield does not belong to the figure. 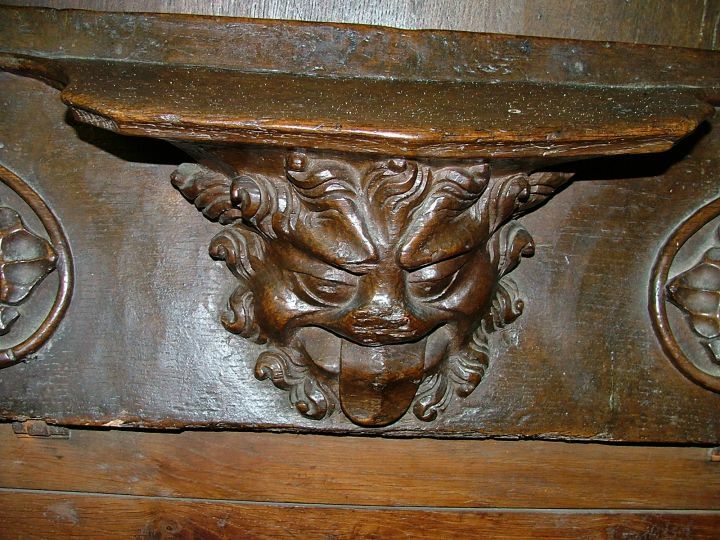 Misericords of medieval origin have been fitted into the later stalls in the chancel, and probably came from the Priory church. The cusping of what must have been a magnificent canopy over the piscina has been sliced off flush to the wall, presumably to be plastered over and then later revealed by the Victorians. High on the opposite wall is a small window into what was probably a chapel above the sacristy. Some wag has put a skull in it facing outwards, no doubt in an attempt to generate a host of myths and legends. 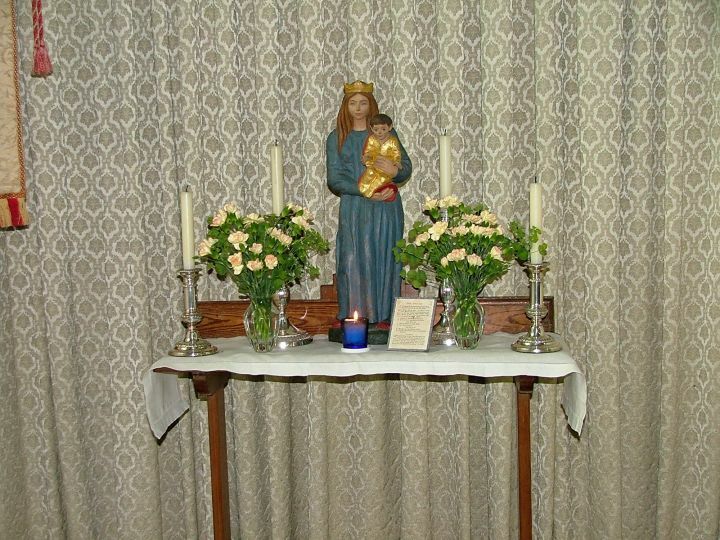 But my main impression was of a well-loved, well-kept devotional church that is very much alive.